Arguing for the “action” at the heart of inaction is an existential declaration, an act of defiance and recognition of the contradictions at the heart of the world. And if that’s true then so too is the acknowledgement that the manic, visceral, action-filled world of MMA is fueled as much by minutiae and monotony and the slow, careful assemblage of contracts, gyms, and techniques as it is spinning back fists, flying armbars, and championship belts. At its core MMA is just as drab as anything else. And just as thrilling. 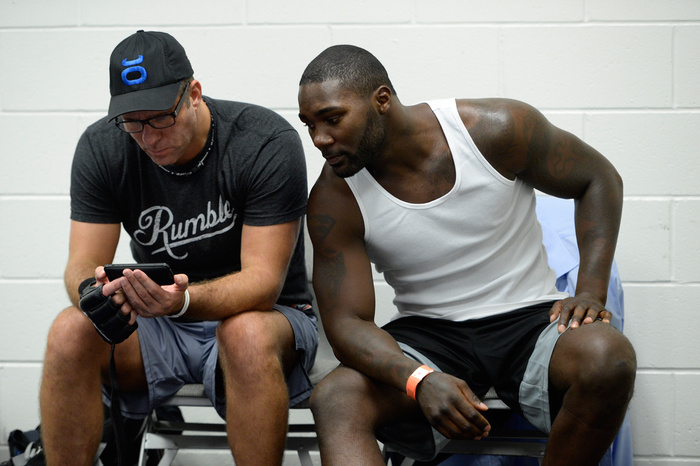 Take the thankless life of an MMA manager. You spend all your time finding sponsors for clients and negotiating contracts and nursing fighters’ egos, and no one seems to care. No one even thinks to speak to you when one of your fighters wins a championship belt or gets a starring role in a movie, but as soon as one of them tests positive for steroids or gets caught assaulting his wife or crashes his car into a pregnant woman and runs away from the scene of the crash before returning briefly to grab a bag full of money and running away again, then all of a sudden you’re the one talking to the press. Suddenly your life is filled with madness. You must go on. You can’t go on. You’ll go on. All for 10%. If that kind of life sounds like fun, then independent video game studio Bit By Bit has the app for you. 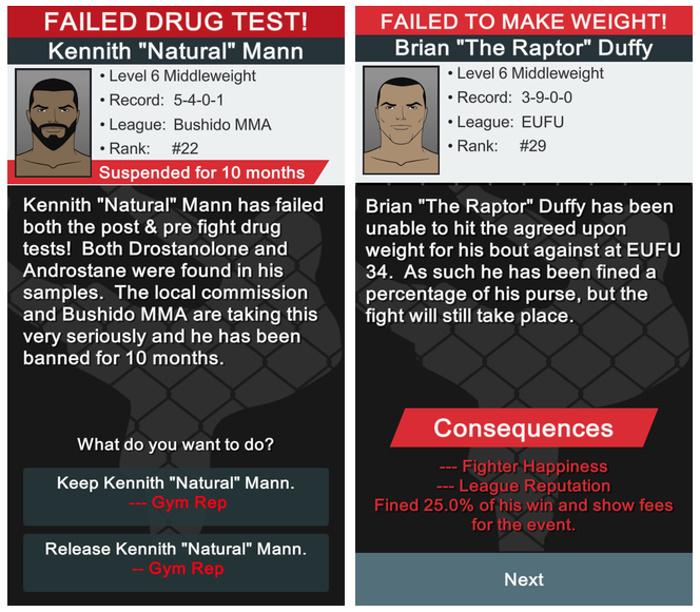 MMA Manager is a brand-new simulation/management game for your mobile phone that allows you to go inside the life of a fight manager, to assemble and control the fates of your own fight team, experiencing firsthand how the sport you love actually comes together. The game, which is much more like the text-based models of early-early video games like Oregon Trail than lifelike modern-day animated sports games like EA Sports UFC (which simulates “full-body deformation” in gruesome and loving detail), requires players to navigate all the mundane minutiae of the fighting world, from recruitment to contract-negotiations to game-planning. What percentage of a fighter’s purse will your team get? How well will he get along with his teammates? How often will he want a break from training? What travel expenses will you incur getting him to a particular event? Will you accept a promoter’s offer of an $8000 purse for a main event win, or will you counter? You’ll need to find your team members sponsorship deals, of course, and hire coaches, keeping in mind how much a particular coach will boost your team’s reputation and how difficult he is to work with. There will be contracts to be renegotiated after a fighter has a big win or a big loss, promoters to be placated after one of your fighters gets injured or fails to make weight, and a gym to purchase equipment for. And then there’s fight night. Just because MMA Manager features no animation doesn’t mean there’s no action. Remember, the age of online existential entertainment is upon us, which means the mundane is now the thrilling. So there’s always work to be done. When it’s time for a “fight” you’ve got to assess your fighter’s skills and the skills of his opponent and come up with a game plan. You’re the one responsible for giving your guy a pep talk in between rounds. And if his opponent goes for a single-leg takedown and the game offers you the option of responding by either 1) staying up or 2) getting top control, which will you choose? And where will that leave him? And where will that leave you? All those infinite options reduced in a moment to a single click of a button. All life coming down to one tiny decision. And in the end, to put a fine point on the cruelty of the life you’ve chosen, every one of your fighters will eventually age out of the sport and you’ll have to be the one to break it to them when they do. As the Episcopalians say, in the midst of life we are in death. Which means, manager, putting aside sentiment, throwing your delusions away, and getting on with the demise of the last generation and the recruitment of the next.